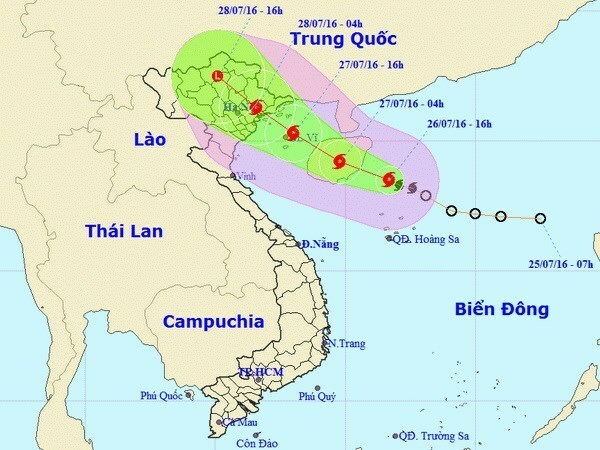 Hanoi (VNA) – The Central Steering Committee for Flood and Storm Control and the National Committee for Search and Rescue held a teleconference on July 26 to deploy works to coping with typhoon Mirinae – the first to batter Vietnam this year. Authorities of Quang Ninh, Hai Phong, Thai Binh, Nam Dinh, Ha Giang, Lang Son, Cao Bang, Bac Kan, Thai Nguyen, Tuyen Quang, Bac Ninh and Binh Dinh attended the event. Chairing the teleconference, Minister of Agriculture and Rural Development Cao Duc Phat, who is also head of the central steering committee, called for the serious implementation of the National Committee for Search and Rescue’s urgent order to cope with the storm, including closely managing coastal tourist activities and evacuation in landslide-prone areas in Quang Ninh and Hai Phong, and ensuring the safety of islanders and aquaculture zones. Urgent tasks mentioned in the order should be performed before 6pm on July 27. Members of the central steering committee were assigned to make fact-finding trips to the northern provinces of Thai Nguyen, Bac Giang and Bac Ninh to inspect disaster prevention and control. According to the National Centre for Hydro-meteorological Forecasting, by 1pm on July 26, the storm was centered at about 18.3 degrees north latitude and 112.1 degrees east longitude, about 170km north of Vietnam’s Hoang Sa (Paracel) archipelago. In the next 24 hours, the storm is forecast to move west-northwest at a speed of up to 20km per hour. The northeastern and northern mountainous areas are forecast to experience heavy rains on the evening of July 27. Border guards from Quang Ninh to Phu Yen provinces will be on duty round-the-clock with 67 boats, 205 canoes and 352 automobiles. The Vietnam News Agency, Vietnam Television and Radio the Voice of Vietnam will regularly update the latest information about the disaster to the public.